We at Techware Distribution are committed to shipping the finest products, packaged professionally and shipped accurately. To that end I present you the momentus acheivement that took place on May 9th, 2008 between the hours of 4:00pm and 5:00pm. It was at that time that Nick our logistics manager put the “cornerbox” in what can only be described as one of the finest packaging stacks seen in recent memory. The boxes level and precise, the structural integrity: solid. Once again we have been asked to donate duplication services to help the Special Olympics tell the story of two phenomenal athletes and their families. Techwaredist.com will be providing the discs and duplication services for the distribution of “The Story of Athlete Maggie Weiss” and “The Kellen Kaassa Story” It is an honor to be partnered with such a wonderful organization and to be able to help spread the word about these outstanding individuals. For more information or to donate please visit: Special Olympics Minnesota. 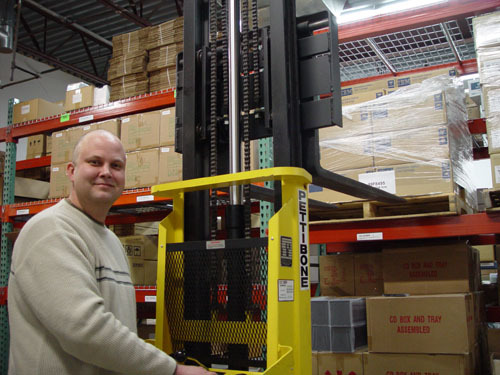 Nick brings over 15 years of warehousing experience and 12 years of proven logistic, supply chain and inventory management. We are excited to have Nick join our team. His wealth of knowledge is a boon to both Techware Dist and all our partners. Nick is dedicated to making sure that all our customers needs are met on a professional and timely basis.